AccuWeather published a story today predicting that tornado activity this year will focus on springtime twisters in Tornado Alley and that the United States will see 1,075 tornadoes in the year 2019, coming in six percent below average. Oh, word? The statement offers no qualification. They don't show their work. There's some text about what they expect this year and what's normal and how tornadoes get ratings, but there's nothing more about that extremely specific number that says "this is an estimate" or "here's the margin of error" or "we arrived at this number by taking Phil the Groundhog hostage and pumping him full of M&Ms until he was wired enough to shake a crystal ball and see through the time-space continuum." Nope. Just a matter-of-fact statement: "AccuWeather predicts there will be 1,075 tornadoes in 2019, which is nine percent more than the 987 tornadoes in 2018." The Pennsylvania-based weather company has a history of making maverick-adjacent moves when it comes to long-term weather prediction. Predicting the exact number of tornadoes that will form this year—with no further explanation, no margin of error, just presented as if decreed by an oracle from on high—is the latest in a series of vanguard-ish stances taken by AccuWeather in recent years. The company started releasing 45-day weather forecasts earlier this decade, stretching them out to 90 days after a couple of years. The company says that these forecasts are really trends to help you get a general idea of the weather in a few months, but they're...uh, not accurate...and, even as they're justified as "just trends," they're certainly presented as a detailed weather forecast to their target audience. For example, AccuWeather's forecast for my town for Sunday, May 26— 90 days from today—shows a high of 74°F and a low of 54°F with a 40% chance of thunderstorms. Their forecast for May 26 issued on February 26 predicts an east wind of 7 MPH with gusts to 15 MPH. They say that the Sunday three months from today will see rain for three hours that amounts to two-tenths of an inch. Trend? No. And the tornado forecast they issued today isn't a trend, either. They know that people are going to read this PR stunt literally. Whether or not it's accurate doesn't even begin to approach the fact that it's not scientifically justifiable to predict an exact number of tornadoes for the year or tell us what the weather's going to be like with mind-bending specificity 2,160 hours from now. A specific number of tornadoes doesn't really help people much, anyway. What's 1,075 tornadoes in the grand scheme of things? How many tornadoes constitutes an outbreak? How many tornadoes does it take to destroy your house? You could make basically the same argument when it comes to hurricane season predictions, but at least those involve ranges and some general vagueness. I'm sure that some news organization or weather blog is going to reach out to AccuWeather for comment. They're going to try to get an answer for how AccuWeather arrived at this extremely specific number. Whoever speaks with them will likely talk in circles and avoid answering the question. It's proprietary. It's a trend. Take it seriously, not literally. But clarification after the fact doesn't matter. The statement is out there. The number is out there. That's what they chose to present to the world. AccuWeather predicts 1,075 tornadoes this year. And yet, somehow, they couldn't predict the reaction to last month's marketing stunt putting down National Weather Service meteorologists to boost their own products during the lengthy government shutdown that caused many of those hard-working government scientists to drain their bank accounts to zero to stay afloat. I should point out that there are a lot of fantastic scientists who work for that organization and I consider many of them good friends. Stuff like this, though? This is coming from the top. And as long as the top-level culture gets a rush whenever the weather community condemns their latest marketing stunt, this is the kind of stuff we're going to have to deal with. NOAA announced on Tuesday that the agency will delay the release of the updated GFS weather model because they accidentally gave it the personality of a husky. -The snow depth and the water equivalent of snow depth at the surface have unrealistically large values when precipitation occurs in environments with low-level temperature profiles close to freezing. Techniques that use either of these variables for deriving snowfall will exhibit excessive snowfall values. -The model forecasts exhibit a cold bias in the lower atmosphere that became more prominent after late September 2018. In other words, certain situations can cause the model to exaggerate cold and snowy weather like a Twitter account that inexplicably has a five-figure following. 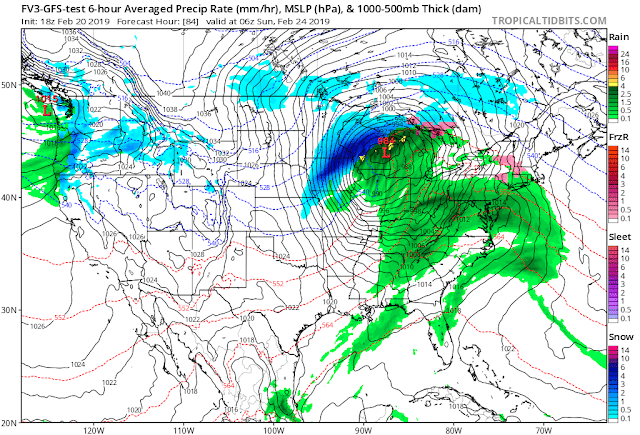 The GFS model, often referred to as "the American model" in weather forecasts, is one of two major global weather models—the other being the much-vaunted European model—that meteorologists use to guide their forecasting process. GFS-FV3 utilizes a new dynamical core (Finite Volume Cubed-Sphere) that gives the model improved resolution and accuracy. The updated GFS model can, for instance, visualize thunderstorms in a way previous versions couldn't. The operational readiness of the updated GFS model has been a hot topic of debate for meteorologists on social media. The Washington Post's Capital Weather Gang covered the issue just a couple of weeks ago when some meteorologists began to voice concern that a buggy model was being rushed into service. The scientists working on this (and all) of NOAA's weather models are hard at work resolving the issue, and they'll probably have it fixed within the next couple of months. NOAA's press release notes that the delay is indefinite, giving the team time and space to work on a fix. You can still view experimental runs of the model on pretty much any weather modelling website, including Tropical Tidbits, which is the (fantastic) site I usually use anytime I need a model graphic. An intense windstorm will rake much of the eastern United States on Sunday as a powerful low-pressure system tracks across the Great Lakes. 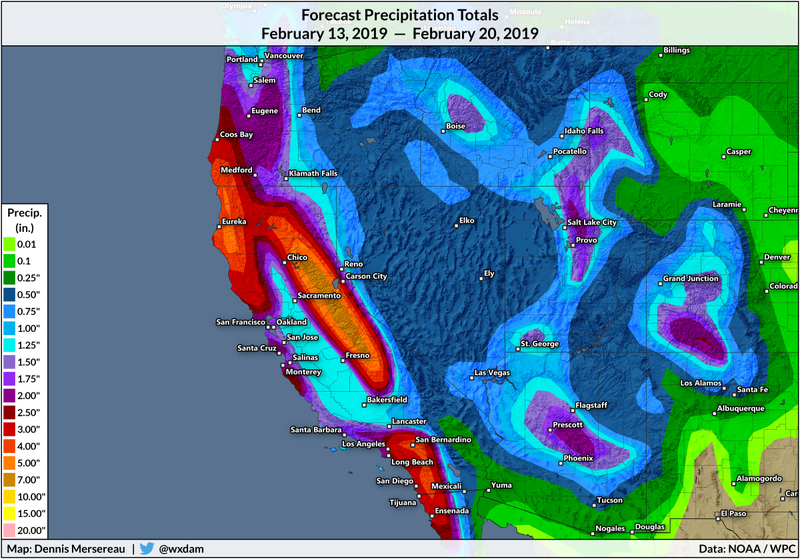 The storm system in question is part of the same upper-level trough that brought rare winter weather to low elevations in southern California and the desert southwest on Thursday and spawned dangerous severe thunderstorms in the southeast on Saturday. 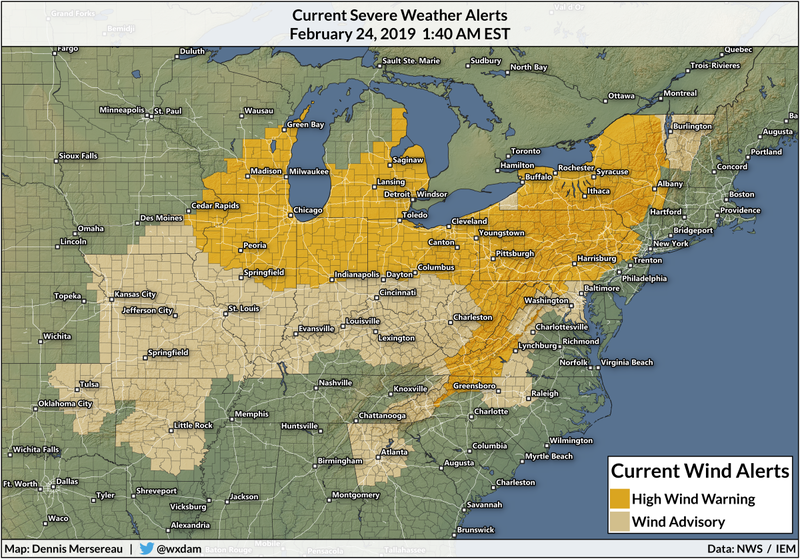 Wind gusts topping 70 MPH in some places could lead to widespread power outages and tree damage. The most striking feature on weather maps going into Sunday was the giant splotch of wind advisories and warnings covering all or part of more than 20 states. The criteria for a wind advisory or a high wind warning differs from region to region, but the gist is that winds will get high enough on Sunday to knock down trees and power lines, especially where the ground is saturated from recent heavy rains. Blizzard warnings supplant some of the wind advisories to the west of where the alerts on this map stop, including in the northwestern part of Michigan's Lower Peninsula, as well as parts of Iowa, Minnesota, and Wisconsin. Intense wind gusts are likely on Sunday due to a low-pressure system explosively intensifying as it moves northeast across the Great Lakes. The low will undergo what’s known as bombogenesis, a process that’s often referred to as “bombing-out” or (annoyingly) a “bomb cyclone” in news coverage. Bombogenesis occurs when the minimum central pressure in a cyclone drops by 24 millibars or more in 24 hours. The low had a minimum pressure of 994 mb as it moved over eastern Iowa at 10:00 PM EST on Saturday. By Sunday afternoon, the low will be near the Great Lakes with a minimum pressure of about 975 mb, which represents a 26 mb drop in 24 hours. An intense low-pressure system that’s rapidly intensifying is prime territory for intense wind gusts. The strongest wind gusts will occur near the Great Lakes where winds could top 70 MPH at times. 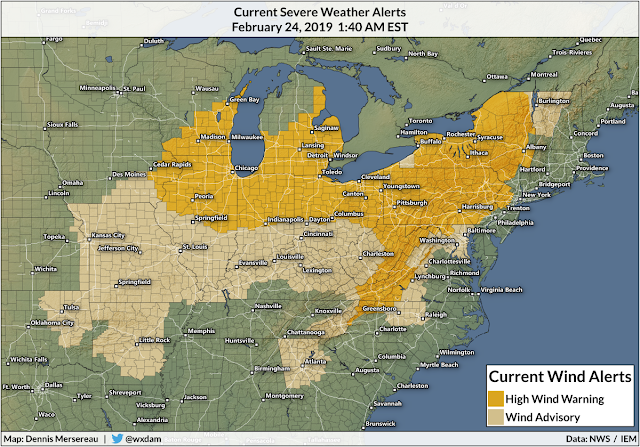 The windstorm could be particularly severe in western New York, where a long fetch over Lake Erie will allow winds to gust to 75 MPH near the coast. Not only will the winds cause damage, but this storm could result in a significant seiche on Lakes Erie and Ontario, potentially leading to major coastal flooding on the eastern shores of the two bodies of water. ALONG THE LAKE ERIE SHORE...LAKESHORE FLOODING IS EXPECTED, AND THIS IS LIKELY TO BE A HIGH END EVENT. GUIDANCE SUGGESTS THE WATER LEVEL AT BUFFALO MAY EXCEED 11 FEET ABOVE LOW WATER DATUM. THE WILDCARD IS HOW MUCH THE LAKE ICE WILL RESTRICT THE SEICHE. DURING A MODEST WIND EVENT A FEW DAYS AGO, SATELLITE IMAGERY SHOWED THE ICE ON LAKE ERIE MOVING, SUGGESTING IT IS NOT FAST ICE AND THE WIND WILL BE ABLE TO MOVE THE WATER AND ICE SIGNIFICANTLY. DATUM, FLOODING MAY OCCUR AT CANALSIDE AND IN THE OLD FIRST WARD SECTION OF BUFFALO. IN ADDITION, RISES WILL BREAK UP ICE IN PLACE ON THE LAKE, AND THIS WILL GET PUSHED ONTO SHORELINE AREAS LIKELY CAUSING DAMAGE TO THE IMMEDIATE LAKESHORE, INCLUDING THE BUFFALO HARBOR AND BUFFALO WATERFRONT. ICE CHUNKS MAY DAMAGE STRUCTURES, AND EVEN GET PUSHED INTO RIVERS AND CREEKS FLOWING INTO LAKE ERIE. ICE WILL ALSO GET PUSHED ACROSS THE NIAGARA RIVER ICE BOOM INTO THE UPPER NIAGARA RIVER LIKELY CAUSING DAMAGE ALONG SHORELINE AREAS OF THE UPPER NIAGARA RIVER. THE HIGHEST WATER LEVELS WILL BE SUNDAY AFTERNOON AND EARLY SUNDAY EVENING. A seiche occurs when wind causes the water in a lake to slosh back and forth across the entire body of water. Think of a child sliding back and forth in a bathtub—gradually causing larger waves on either end of the tub that eventually splash over the edge and make a mess—just occurring on a much larger (and slower) scale. A wintertime seiche on an ice-covered lake is particularly dangerous because chunks of ice could cause damage to structures along the coast, in addition to the ice chunks causing additional flooding on top of what's already occurring. Make sure you've got batteries and actual flashlights—not just the flashlight feature on your cell phone—as well as some non-perishable, ready-to-eat foods just in case the power goes out for an extended period of time on Sunday. You can keep track of power outages over at PowerOutages.US, a great resource for real-time power outage information across the country. 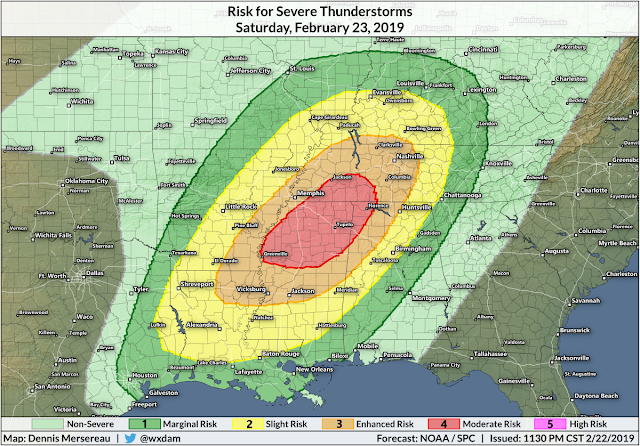 The first significant severe weather outbreak of 2019 is likely to unfold on Saturday across parts of southern United States. An approaching storm system will allow for a dangerous environment in which thunderstorms can grow severe in a hurry. 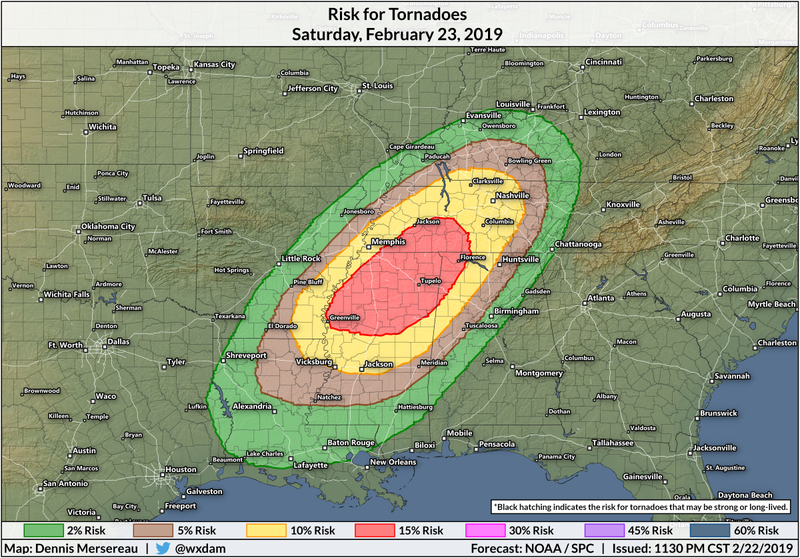 The Storm Prediction Center characterized the threat for Saturday as a "significant tornado and wind damage event" in their Friday night forecast. The severe weather threat will develop during the late morning hours and continue through nightfall. The same upper-level trough that brought unusual snow to southern California and the desert southwest on Thursday will serve as the catalyst for the severe weather we'll see on Saturday. A surface low-pressure system was already developing in northeastern New Mexico on Friday night. This low will continue to strengthen as it moves across the southern Plains and into the Midwest through Saturday evening. A combination of warm air, muggy dew points, and an advancing cold front will trigger the development of strong thunderstorms across the Deep South on Saturday afternoon. The storms will likely turn severe as they interact with robust wind shear passing over the region. Friday's late-night forecast from the Storm Prediction Center paints a moderate risk for severe thunderstorms across parts of Mississippi, Alabama, and Tennessee, which is a 4 out of 5 on an ascending scale measuring the threat for severe weather across a region. An enhanced risk for severe thunderstorms—a 3 out of 5 on the scale—stretches from northeastern Louisiana to central Tennessee, including Memphis, Nashville and Jackson, Mississippi. The moderate and enhanced risks are in place due to the threat for strong, long-lived tornadoes and damaging straight-line wind gusts in excess of 70 MPH. The threat for these two significant hazards isn't confined to the areas shaded orange and red on the map, but it's where the SPC expects the environment to be most conducive for the most dangerous thunderstorms to develop. Storms are likely to fire-up across the western risk areas in the late morning hours on Saturday, continuing to grow in strength and extent as they move east through the afternoon and evening hours. Many areas in the eastern part of the risk areas could deal with their severe threat after nightfall, which adds an extra element of danger for folks who insist on looking outside (which, let's face it, is pretty much everyone) before diving for the basement or interior bathroom. It's tempting to focus solely on the bullseye in a severe weather forecast, but it's important to remember that severe thunderstorms are also possible in the marginal (dark green) and slight (yellow) risk areas. Everyone between Little Rock, Baton Rouge, Birmingham, and Evansville should stay alert tomorrow and prepare to take quick action if a warning is issued. Damaging straight-line wind gusts are most likely in storms that form into squall lines, while the threat for strong tornadoes and large hail are more likely in individual storms that are able to fully interact with the environment without contamination from nearby storms choking off their supply of unstable air. There's also a risk for flash flooding across the affected areas. Flooding adds insult to injury when there's a threat for major severe weather. Parts of Mississippi and Alabama have seen 8-10 inches of rain in the last week. Many of these same areas will see even more heavy rain with the storms on Saturday. It's a good idea to stay off the roads (and avoid storm chasing!) to avoid running into flooded roadways when you might have to outrun dangerous thunderstorms. 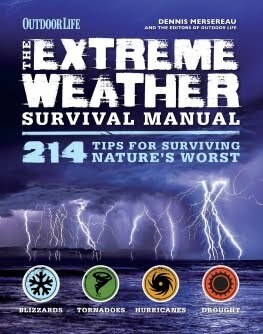 Here are some tips to remember on Saturday, especially if you're visiting this region and you're not accustomed to preparing for severe thunderstorms. Remember that a tornado watch means that conditions are favorable for the development of tornadoes over the next couple of hours. A tornado warning means that a thunderstorm is capable of producing a tornado based on strong rotation detected by Doppler radar, or that someone spotted a tornado in progress. A watch means to watch for storms. A warning means you need to act immediately. Tornado warnings are represented on most weather maps and radar imagery as a red polygon. The threat for the tornado is greatest within that polygon, but areas just outside of a warning polygon should keep an eye on the storm. Polygons are drawn based on the speed and motion of a thunderstorm. Storms can change direction and speed up or slow down without much notice. Make sure you have a way to receive severe weather warnings the moment they're issued. Enable the emergency alerts function on your cell phone. Wireless Emergency Alerts are free push notifications sent out by the National Weather Service using cell phone towers to triangulate your position and determine if you're in a tornado or flash flood warning. Do not rely on tornado sirens for tornado warnings. These aging systems are unreliable and they're only designed to be heard outdoors. People have died in tornadoes because they relied on tornado sirens that they never heard. If you don't have a cell phone—or if you live in an area with an unreliable signal—listen to television, radio, or NOAA weather radio for severe weather updates. Local news stations will run wall-to-wall coverage if tornado warnings are in effect, and many radio stations in the south will stream those severe weather newscasts. The best place to ride out a tornado is in an underground basement or dedicated tornado shelter. If you can't get underground, your best bet is an interior room on the lowest level of the building. The goal is to put as many walls between you and flying debris as possible. An interior bathroom works really well since there are pipes in the walls and (usually) a bathtub to crouch in. Wear closed-toe shoes like sneakers or boots if you're under the threat for tornadoes. You don't want to get caught walking through broken glass and wooden splinters barefooted or in flimsy flip-flops. Wear bicycle or motorcycle helmets if you have to take shelter during a tornado warning. You might look like an idiot, but the fashion police are taking cover, too, and the helmet could save you from head injuries if the worst happens. Since we're getting into severe weather season, it's a good idea to make the Storm Prediction Center's website a part of your daily routine if you live in a part of the country prone to severe thunderstorms. The SPC's forecasts are tremendous and they can keep you informed of a potential severe weather outbreak days in advance. Every day is mildew season in the southeastern United States these days since it's apparently never going to stop raining. 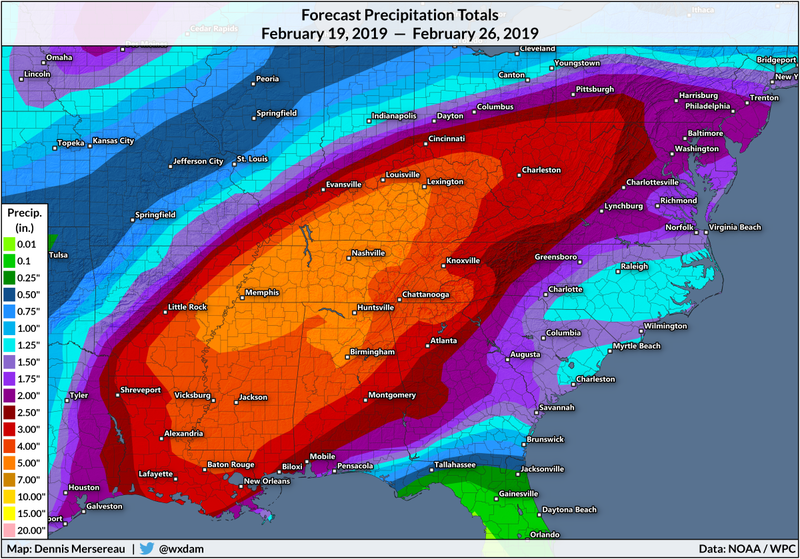 That interminable wet streak will continue with five or more inches of rain anticipated over the next seven days across an enormous swath of the south. It's uncommon to see such a big slug of heavy rain in this part of the country without a tropical system involved. The latest precipitation forecast from the Weather Prediction Center shows the opportunity for five or more inches of rain centered on the mid-South. The precipitation will come in several major waves. The first storm system will develop tonight and last through Thursday morning, bringing heavy rain and thunderstorms to the southeast. Some of the thunderstorms could even be severe with gusty winds, large hail, and a few tornadoes. The next chances for heavy rain will begin Friday and last through the weekend. More rain is expected over the affected areas next week. It looks like a safe bet that the heaviest rain will continue moving over the same areas because the upper-levels seem to be on pause for the time being. The above animation shows height anomalies at the 500 millibar level between Tuesday morning and Sunday morning. The trough over the western United States and the ridge over the southwestern Atlantic don't move much longitudinally through early next week. The southeast is in the unlucky position to get pinched between the trough and the ridge, forcing that highway of precipitation to keep moving over the same areas. Not everyone will see all of the rain in the forecast. Some communities will only see an inch or two of rain and others could see half a foot or more. It depends on the tracks of thunderstorms and batches of heavy rain as they traverse the area. Rain this heavy could lead to flooding, especially along streams and rivers. Sustained heavy rain could lead to street flooding. I'm sure we'll see video of someone trying to ford a flooded roadway like they're the protagonist in Oregon Trail. Here's a hint for you: you won't get dysentery, but try to cross a flooded road and you could wash away and die. It's nearly impossible to judge the depth of water crossing a roadway and you can't be completely sure that there's even a road under the water. It can take just a foot of moving water to wash a vehicle downstream. Flash flooding is likely across parts of California and Arizona on Thursday as an approaching storm system threatens to bring several inches of rain in a short period of time. Flood watches stretch from northern California to southeastern Arizona in anticipation of the heavy rain. It doesn't take much heavy rain in this part of the country to cause significant flooding problems. A potent upper-level trough moving toward California this hour is responsible for the low-pressure system that will cause all of the headaches on Thursday. The latest forecast from the Weather Prediction Center calls for several inches of rain across most of the state, save for some of the rain shadows and the southern half of the Central Valley. 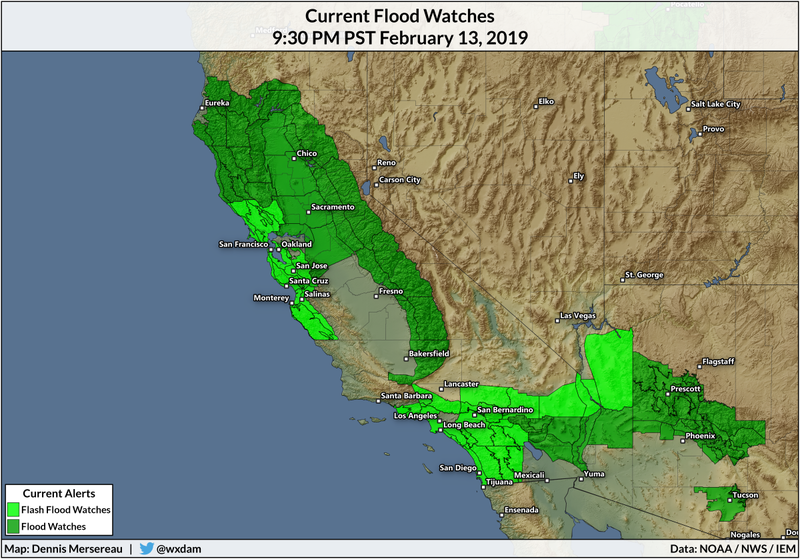 Accordingly, flash flood watches (that light green Mr. Yuk color) and flood watches (dark green) are in effect for much of California and parts of Arizona. Urban flooding, overflowing waterways, and flash flooding in rough terrain is likely during the heaviest rain. Mudslides are also possible on burn scars. There's a ton of moisture in the atmosphere for the developing showers and thunderstorms to work with. Southwesterly flow around the southern end of the low is dragging deep tropical moisture north toward California. This ribbon of moisture, known as an "atmospheric river," is usually what's responsible for the intense rain events we see on the West Coast. You can see the atmospheric river approaching southern California in the image above, which shows precipitable water (PWAT) across the eastern Pacific. Precipitable water is the amount of rain that would fall if you condensed all the water vapor in a column of the atmosphere. If the PWAT over your house is 1.15", it means that you'd get about 1.15" of rain if you condensed all of the water vapor in the atmosphere above your town. PWAT isn't the whole story, of course, but higher PWAT values indicate a better opportunity for heavy rain—it's a deeper reservoir of moisture for showers and thunderstorms to tap into. It's not just the heavy rain you have to look out for. Some of those thunderstorms could be on the stronger side. The Storm Prediction Center says there's a marginal risk of severe thunderstorms in the Central Valley between Sacramento and Fresno. The agency's late-night forecast on Wednesday said that any thunderstorm that can get strong enough could produce gusty winds, small hall, or even a brief tornado. Tornadoes aren't all that uncommon in California, and this area is exactly where you'd expect to see them develop. Also: snow. Lots of it. Not only is this good for ski resorts, but this kind of snowpack will help replenish bodies of water downstream once it all starts to melt during the warmer months. The above analysis from NOHRSC shows seasonal snowfall accumulations between 10 and 20 feet near the mountain peaks, with some areas seeing seasonal totals closer to 30 feet. 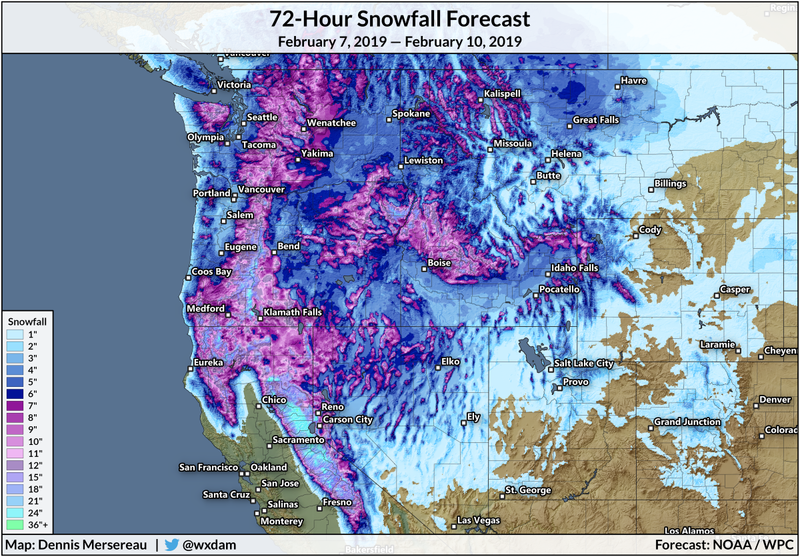 The latest snowfall forecasts easily add 3+ feet to those totals through this weekend. This has been an exceptionally warm week for parts of the southern and eastern United States, where record highs fell on Thursday—some in resounding fashion—as daytime high temperatures climbed 30°F or more above normal in spots. The spring preview came to a dramatic end on Friday as a potent cold front returned temperatures to what they should feel like at the beginning of February. It's something else to see such a stark contrast on a nationwide temperature map. That's about as sharp of a difference between north and south as you can get. 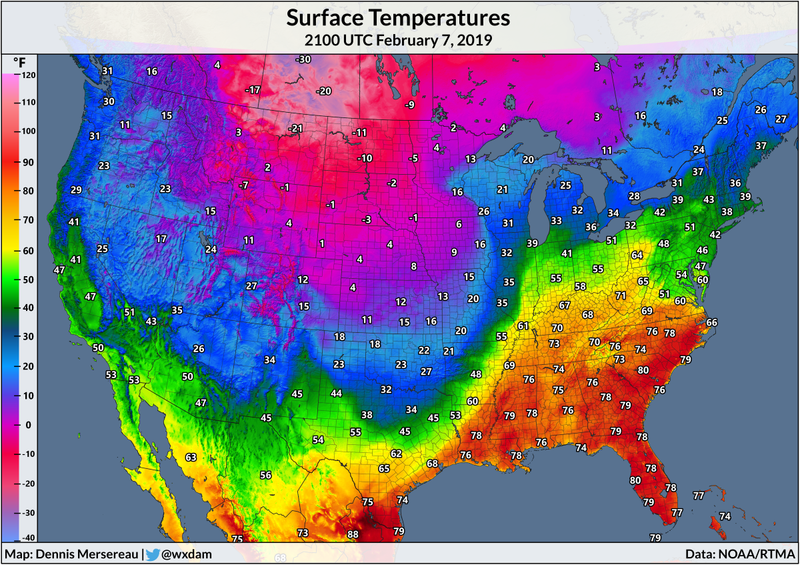 The temperature on Thursday afternoon at 2100 UTC—which is 4:00 PM Eastern—was in the 80s across parts of the Carolinas and Georgia while northeastern Montana was mired in the -20s. Temperatures dropped as much as 40 degrees in the Mississippi River Valley when the cold front passed through. 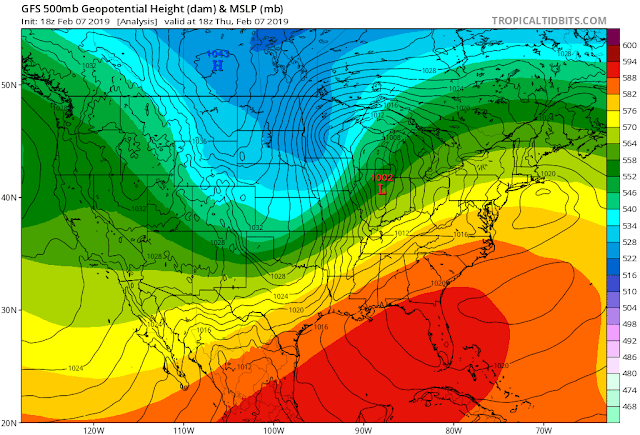 That upper-level trough is the force behind those bitterly cold temperatures in the north-central part of the United States. It made it up to a whopping -16°F on Thursday afternoon in Glasgow, Montana, while Rapid City, South Dakota, saw a balmy high of -1°F. While that high in Glasgow was a record low maximum (the lowest high temperature) for the date, there have been multiple days in February that didn't get out of the -20s since the station's records began in the late 1940s. Farther south, that strong ridge over the southeastern states, along with warm, humid winds blowing some evaporated paradise straight from the Gulf and Caribbean, allowed temperatures to soar into record territory today, the climax of an exceptionally warm week for the beginning of February. The temperature at the airport near my tiny North Carolina town hit 81°F on Thursday. The official co-op station down the street from me recorded 79°F, which was a record high for the date. In fact, if you include today's warmth, 11 of the 29 record highs for the month of February for the nearby observing station were recorded in 2017, 2018, or 2019. Danville, VA, saw a high of 80°F, the second-warmest on record for February. Greensboro, N.C., reached 79°F, beating the previous daily record of 73°F. Raleigh, N.C., reached 79°F, beating the previous daily record of 76°F. Charlotte, N.C., also reached 79°F (see a pattern? ), 5°F higher than the old record. Fayetteville, N.C., managed to get up to 81°F, also a daily record. Wilmington, N.C., reached 83°F, tying February's second-highest temperature. Columbia, S.C., hit 83°F, falling 1°F shy of tying the all-time record for February. Charleston, S.C., set a daily high temperature record of 80°F today. Greenville, S.C., saw 77°F today, 7°F higher than the previous daily record. Augusta, GA, reached 85°F (! ), the daily record and second-highest for February. Macon, GA, saw a high of 81°F, two degrees higher than the previous daily record. It's worth remembering that this is the first week of February—it wouldn't be too out of the ordinary to see temperatures like this on February 28, especially farther south, but that's three weeks from now. Three weeks is an eternity when it comes to the changing seasons. This exceptional warm-up came directly on the heels of a piece of the much-ballyhooed polar vortex breaking off and slumping down over the Upper Midwest. Raw air temperatures dipped below -40°F for several days in Minnesota and Wisconsin, breaking some impressive records in many locations. Above-normal temperatures will likely persist in the southeastern United States over the next two weeks, though not by nearly as much of an extreme as we saw this week. It's malpractice to talk about the warmth without addressing climate change. With each winter cold snap comes an avalanche of climate change jokes. Har har, climate change is a hoax because I threw a snowball in the Senate. We could use some of that global "waming" when it's this cold out! And on, and on. When the temperature is 30°F above normal on February 7, though, the folks who make those jokes don't make a peep. Aside from the intellectual dishonesty involved, a large part of the silence in the face of abnormal warmth is the fact that we've grown so used to warmth that we hardly pay any mind to a day that's double-digits above average. We only seem to notice it when it's 80°F at the beginning of February and there are wasps flying around. Unusually cool days stick out like an especially sore thumb because they're getting outnumbered. It may be tempting to question climate change in the face of daytime temperatures far below zero in the northern Plains, but the world is much bigger than our backyards.